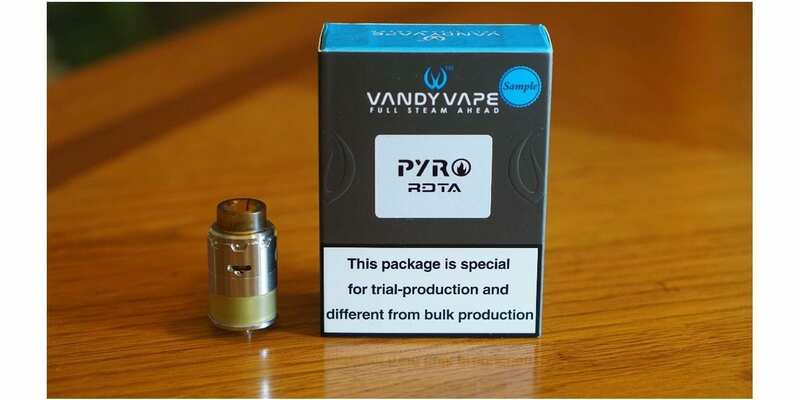 Vandy Vape Pyro RDTA Review - Daily Vaping Deals & The Best Vape Product Reviews at Vaping Cheap! If you’ve read our previous vape reviews, then you know we’re fans of what Vandy Vape has been releasing. They’ve now released the newest atomizer to join their lineup, the Pyro RDTA. This RDTA differs from the competition with its unique build deck, airflow configuration and fill system. Like many new atomizers to hit the market, this one does sport an overall base diameter of 24.4mm. How does the Vandy Vape Pyro RDTA compare to the rest? We’ll find out in this review! Before getting any further, we’d like to thank Vandy Vape for sending this atomizer our way for the purposes of this review. We’ll cover our first impressions, building and wicking, performance, pros and cons, and conclude with whether or not we recommend the Pyro RDTA! Visit Vandy Vape Here! Purchase Here! Click Here to Check Out the VandyVape Pyro RDTA! Like many Vandy Vape atomizers we’ve reviewed in the past, the Pyro comes packaged in a blue box that showcases the name of the product on the front, and has some minor information on the back. Since this is a sample version, I’m not 100% sure if this is the final packaging, but I wouldn’t be surprised if it was. This isn’t a bad thing by any means as their packaging is very good and keeps everything safe during transit. Once you slide open the packaging, you’re met with the Pyro RDTA, the spare glass tank section and the spare delrin Doc 810 drip tip. The Pyro RDTA comes pre-installed with an Ultem 810 drip tip, and an Ultem tank section. I do like that they offer an Ultem tank section as this gives it a unique look and I’m sure vapers who like Ultem, will absolutely love this setup. Now, if you don’t like Ultem, you can simply change it out with the more traditional clear glass tank section. It’s definitely a pro that they give you these options. Included in the packaging you also receive an accessory bag which has your spare screws and o-rings, a tri-tool and a 510 drip tip adapter. I did receive the stainless steel variant, but there are other colors available such as Gold, Black and the popular Rainbow. Also, something worth mentioning is that the one I received is the 4ml version, but there is a 2ml version for European vapers. They’re implementing a ceramic block to decrease the e-liquid capacity, which is the same they did for the Govad RTA, which is great! 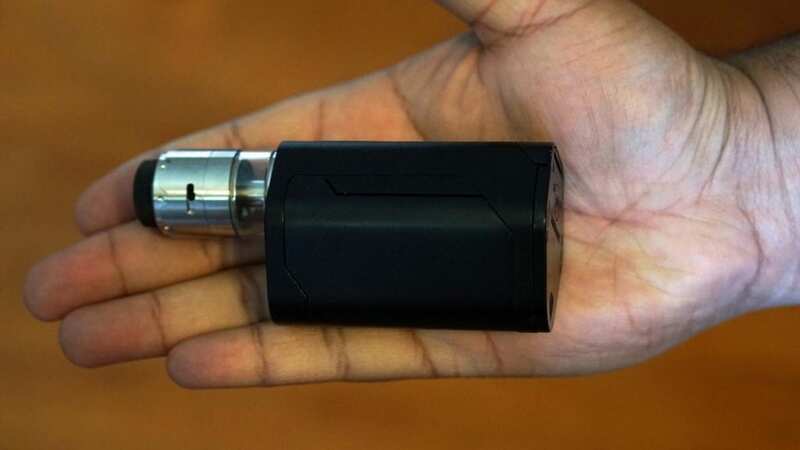 At first glance, I immediately thought this was a very good looking atomizer, and it’s not too tall either which is great as I do dislike very tall atomizers. Many RDTAs tend to be on the taller side, so I was glad to see this one doesn’t fall into that category. 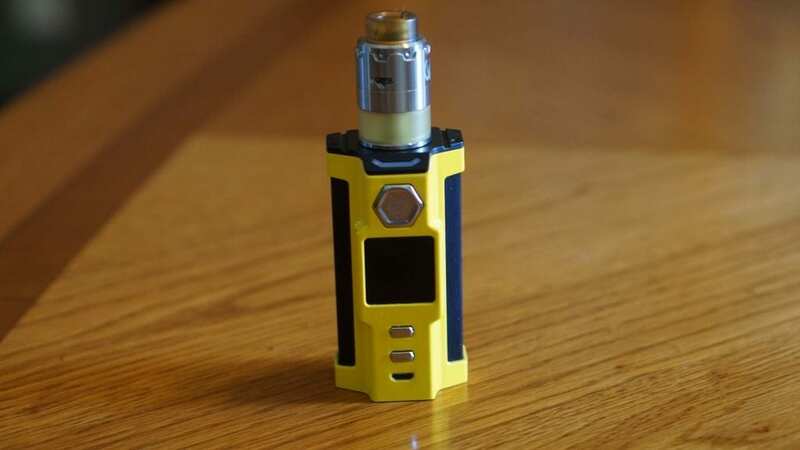 On the top cap, there is a Vandy Vape logo, and this is also where you can adjust the airflow. The airflow is fully adjustable as well, so you can close it off fully, which is a nice touch. The build quality of the Vandy Vape Pyro RDTA is top notch, and is what we’ve come to expect from Vandy Vape. Also, this atomizer came clean with zero machine oil, so one wash with warm water and this RDTA was good to go! All in all, my first impressions of the Pyro was great! There were no initial cons, and I was impressed by the overall design of it. The Pyro RDTA by Vandy Vape features a postless style build deck, so building on this atomizer is quite easy. You can kind of do the same to measure the coil as you would with the Pulse 24 BF RDA, and cut the coil legs the length of the drip tip. I mostly just cut and remeasure to find the exact length I want. You want to make sure your coil sit right next to the airflow channels, but not too off centered, because this can cause a short depending on the diameter of your coil. 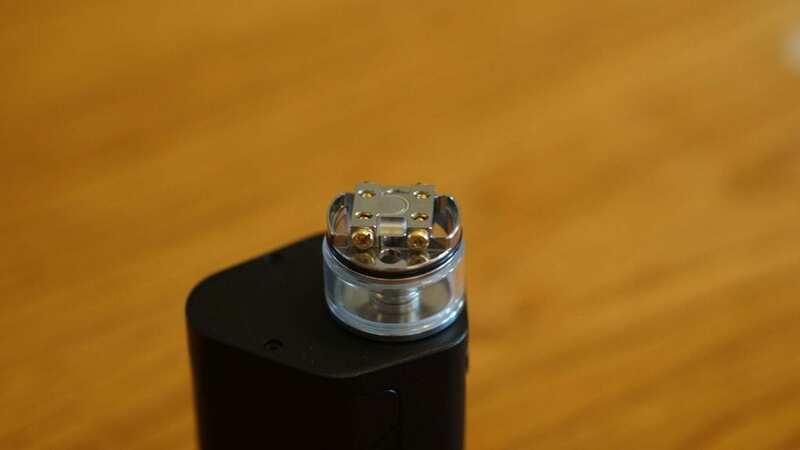 The reason why this would happen is, because when you install the mid section, there is a metal piece that is located on each side of your coils. This metal piece is what extends downwards and covers your juice fill ports. Now this isn’t a really big deal if you don’t vape on really thick wire builds or large diameter coils such as 3.5mm or 4mm. With that being said, I had no issues installing 3mm diameter Fused Claptons, but they were a tight fit. If you decided on building a single coil, then you can get away with a 4mm diameter coil. Like mentioned previously, just be sure to have your coils sit more along the center of the build deck, and not too off centered. In addition, you want the coils to sit a bit higher than your airflow channels, so your coils are just a bit off centered. It really is easy to build on the Pyro RDTA, as with most other postless style decks. Wicking is also incredibly easy, and probably one of, if not the most easiest RDTA to wick. The wicking channels are huge, so you can fit a good amount of cotton in there. Simply measure your cotton so that they will barely stick out into the tank section and cut. Afterwards, fluff out your cotton, and gently tuck them into the wicking ports. Be sure that it’s not too tightly packed, you want your cotton to be able to “breathe”. In addition, once your done wicking be sure to take a screwdriver or any other tool you use and poke it downwards at the end of the cotton on each side, this will allow air to escape and provide efficient wicking. All in all, building and wicking the Vandy Vape Pyro RDTA is easy, and I’m sure both beginners and advanced users will have little to no issues. The only downside is that if you’re installing dual coils, you’re kind of limited to the diameter of the coil. Now the biggest question of this review is how is the performance? I can easily say the performance of this RDTA is excellent! Honestly, when first taking a look at the design, even though unique, I wasn’t quite sure how it would perform in regards to flavor especially. There are airflow channels that are angled which your coils sit next to. With this design, it makes it so that the air will travel under your coils then into your mouth. This airflow system does work, and works pretty well. The airflow is fully adjustable, and it can easily be adjusted via the top cap. With the airflow wide open, there’s very little restriction, which will cater to the vapers who love massive amounts of airflow. Personally, I liked the airflow open about 3/4, and it provided me with a bit more restriction, and helped with the flavor as well. The airflow on this RDTA is very smooth as well, with no turbulence whatsoever, so this is a pro for me. My preferred coil build was a dual fused Clapton, which had a resistance of 0.21 ohm, and I would vape it between 65w and 80w. I did try other coil builds such as a large single Fused Clapton, but to me, it best performed with a dual coil build. It’s a pro though that you can install both single and dual coils without needing a plug or anything. I do recommend if using a single coil to make it larger than a 3mm diameter so you’re able to fill the entire wicking channel. At these wattages and with this build, I experienced excellent flavor and vapor production. The vape was nice and warm as well, which is what I do prefer. The flavor was actually a bit better than what I expected, so I can surely say that the flavor is definitely above average. What helps with the flavor is that the coils are right under the drip tip. You can literally drip e-liquid right down through the drip tip and use it as a dripper if you wanted. The Pyro has a 4ml e-liquid capacity, and it’s easy to fill. There’s 2 fill ports, located on each side of the build deck. You can fill this atomizer with most e-liquid bottles, which is great. Even though it does have a 4ml e-liquid capacity, I found myself plowing through e-juice quickly. It’s to be expected vaping at higher wattages with a Fused Clapton, but it’s something to point out. I do like this fill system, as to me, it’s one of the easier fill systems I’ve come across in RDTAs. One thing to mention is that the included Delrin Doc 810 Drip Tip is not as smooth as the one included with the Vandy Vape Mesh RDA. It feels a bit more rough, and not nearly as comfortable to use. This is a sample version, so I would hope that it’s fixed in the production model. All in all, the performance of the Vandy Vape Pyro RDTA was excellent. There were literally no issues when it came to the performance of this atomizer. In conclusion, the Vandy Vape Pryo RDTA is a solid performing atomizer that’s very easy to build and wick. Honestly, I haven’t been a huge fan of RDTAs and really haven’t used one in quite some time. Even though this is the case, I do see myself using the Pyro more as the flavor is great and filling it is so easy. I do love the fact that Vandy Vape gives you a ton of extras even an ultem tank section, which is something we don’t see too often. There were cons to be mentioned, and the major one was the fact that large dual coils cannot really fit, especially your exotic coils. If you’re a vaper who likes vaping on 4mm diameter coils or just really thick coil builds, then this might be a deal breaker for you. Personally, I typically vape on smaller Fused Claptons (26GA/36GA) and most of the time 3mm diameter, so it wasn’t an issue for me. All in all, if you’re looking for a solid performing RDTA that has an easy fill system and is easy to build and wick, I can easily recommend the Pyro RDTA.